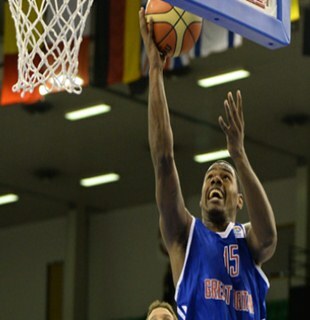 Great Britain displayed nerves of steel in their EuroBasket Men 2013 debut as they escaped with a hard-earned 75-71 win in a tightly-contested match against Israel on Wednesday in Slovenia. Israel were on the verge of running away with an opening-day victory after building a commanding 66-57 lead with 3:08 left to play in the game, but Great Britain had other plans in mind. The British squad a huge 9-0 run from that point, including two pressure-packed free throws from Andrew Lawrence, which brought the game into overtime. In the overtime, Israel took control once again, taking a 71-67 lead, but lightning struck twice into them as Great Britain tied the game at 71 with 1:14 left to play. Kyle Johnson then broke the tie as he converted on a layup to give Great Britain the lead, which was followed by a crucial steal from Andrew Sullivan, who was then fouled and sealed the win for the Brits with two converted shots from the charity stripes. Johnson led Great Britain with 22 points and six rebounds, while Kieron Achara had an outstanding performance, tallying 18 points and 13 boards. Myles Hesson added 14 points and six rebounds, who gave new coach Joe Prunty a winning debut. “I’m really proud of the way the guys battled. Our players stayed composed under difficult circumstances. Of course our assists could be higher and our turnovers lower but we shared the ball better, attacked better, and that growth is what you want to see,” Prunty said. Great Britain will look to sustain momentum when they go up against powerhouse France, while Israel will look to bounce back against Ukraine on Thursday.